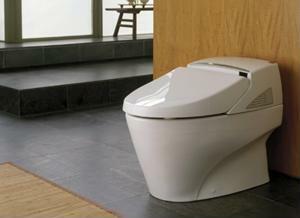 Bathroom Vanities and Accessories Design and Tips | DecorPlanet.com Blog: Would you ask for a toilet for Christmas? This four-year-old did! Would you ask for a toilet for Christmas? This four-year-old did! Dustin Kruse isn't like your standard four-year-old boy - instead of toy trucks and airplanes, he has been fascinated by toilets for as long as he can remember. According to the Daily Mail, Kruse asked his parents for a Kohler Dual Flush toilet for Christmas and he lucked out and received his dream throne for the holiday. Dustin's mother believes his love affair with the toilet came about when they took him to a Kohler showroom when he was three years old. Dustin had already potty-trained himself when he was two years old, so his mind ran wild when he saw the new device. "He was like, 'Mom, I'm asking Santa for this toilet. Wouldn't it be the greatest?'" Dustin's mother told the news source. "And I could just see his little mind think." Dustin's new dual flush toilet uses a half flush for liquids and a full flush for solid material, and he believes that its sustainable design is something that everyone should have. Whether Dustin is an interior design savant or simply a fan of cleanliness, we may never know, but would you ever give your child a brand new toilet for Christmas?